(A-E) CT images show basal predominant, subpleural predominant reticular abnormality, with peripheral traction bronchiectasis (circles in B) but no honeycombing. For this patient, UIP was proven with histology. (A-E) CT images show reticular abnormality with traction bronchiectasis, without honeycombing. Although the abnormality is lower-lung predominant, the findings are not typical for UIP because of peribronchovascular extension (C), patchy ground glass abnormality, and mosaic attenuation (E). For this patient, UIP was proven at biopsy. UIP=usual interstitial pneumonia. 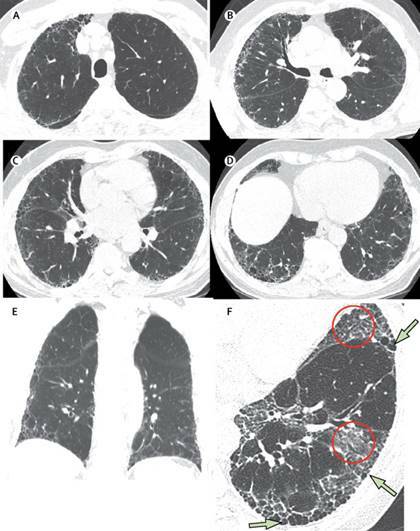 (A-D) Inspiratory CT images show diffuse, peripheral predominant reticular opacities admixed with patchy areas of decreased (mosaic) attenuation (arrows). For this patient, UIP was proven at biopsy. UIP=usual interstitial pneumonia. (A-C) Inspiratory CT images show upper-lobe predominant peribronchovascular (bronchocentric) reticular opacities, architectural distortion, severe traction bronchiectasis, and areas of decreased attenuation (B and C; arrows). 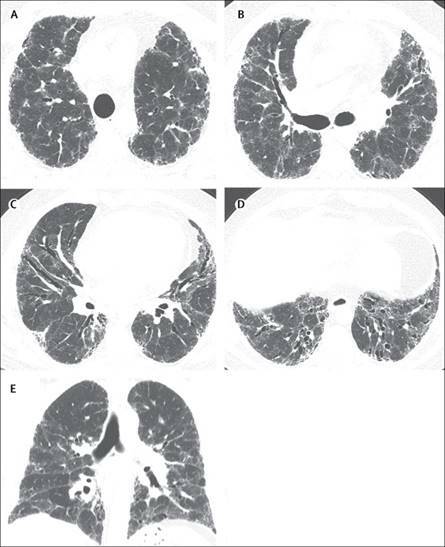 This CT pattern is consistent with the diagnosis of fibrotic hypersensitivity pneumonitis. IPF=idiopathic pulmonary fibrosis. Indeterminate for usual interstitial pneumonia (UIP) pattern (early UIP pattern). (A and B) Transverse computed tomography (CT) section, (C) coronal reconstruction of both lungs, and (D) magnified view of the right lung in supine position showing ground-glass opacity and subtle reticulation in the subpleural areas (arrows) with a basal predominance. (E) Transverse CT section of the lower lung zones in prone position showing persistence of lung infiltration in nondependent areas, thus excluding gravitational abnormalities. UIP was proven at histology. Indeterminate for usual interstitial pneumonia pattern. (A-C) Transverse computed tomography sections showing extensive lung infiltration combining honeycombing, mild to marked ground-glass opacity, asymmetrical distribution between both lungs, and no subpleural predominance. It is now recognized that atypical HRCT features frequently (i.e., about 30%) accompany a histopathologic pattern of UIP/IPF (81). Therefore, the category “indeterminate for UIP pattern” should be assigned when HRCT demonstrates features of fibrosis but does not meet UIP or probable UIP criteria and does not explicitly suggest an alternative diagnosis. This category includes a subset of patients with very limited subpleural ground-glass opacification or reticulation without obvious CT features of fibrosis, for whom there is a suspicion that early UIP or probable UIP is present. In such cases, it should be confirmed with prone inspiratory views that the subpleural opacities do not represent dependent atelectasis (Figure E2). 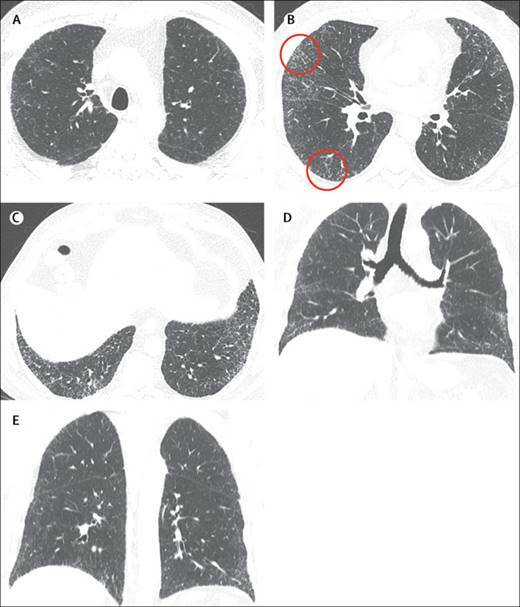 Computed tomography (CT) pattern suggestive of an alternative diagnosis for lung fibrosis. (A and B) Transverse CT sections obtained at deep inspiration showing disseminated lung infiltration, sparing some secondary pulmonary lobules in lung bases. (C) Transverse CT section obtained at expiration confirming lobular air trapping, all findings being highly suggestive of chronic hypersensitivity pneumonitis. 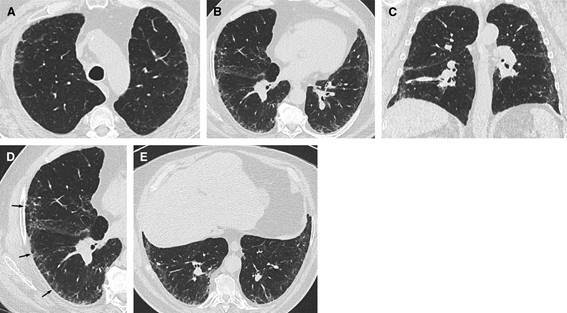 In some cases of fibrotic lung disease, there is clinical suspicion of IPF, but the HRCT pattern suggests an alternative diagnosis. Examples include bronchocentric fibrosis in the upper lobes or profuse mosaic attenuation that suggest hypersensitivity pneumonitis, posterior fibrotic retraction of the hila in sarcoidosis, or extensive ground-glass opacification with subpleural sparing in fibrotic nonspecific interstitial pneumonia (NSIP). Occasionally, the HRCT presentation may be that of a UIP, probable UIP, or indeterminate for UIP pattern, but ancillary findings suggest an alternative diagnosis. In such situations, an alternative diagnosis to IPF should be reconsidered. Histopathology demonstrating usual interstitial pneumonia (UIP). (A) Low-magnification photomicrograph showing classical UIP/idiopathic pulmonary fibrosis (IPF) pattern characterized by dense fibrosis with a predilection for subpleural and paraseptal parenchyma with associated architectural distortion in the form of microscopic honeycomb change (arrow) juxtaposed with relatively unaffected lung parenchyma (*). Visceral pleura is seen in the upper portion of the figure. (B) Higher-magnification photomicrograph showing subpleural scarring and honeycomb change with associated fibroblast foci (arrow). (C) Low-magnification photomicrograph showing probable UIP/IPF pattern characterized by subpleural and paraseptal predominant patchwork fibrosis that is less well developed and lacks the degree of associated architectural distortion in the form of either destructive scarring or honeycomb change illustrated in A and B. (D) Higher-magnification photomicrograph showing patchy fibrosis and fibroblast foci (*) but without the extent of scarring and honeycomb change illustrated in A and B. 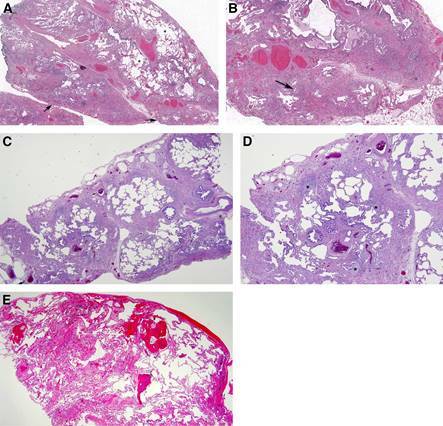 (E) Indeterminate for UIP/IPF pattern in which there is mild nonspecific fibrosis that lacks a well-developed patchy and predominantly subpleural/paraseptal distribution, architectural distortion, and fibroblast foci characteristic of classical UIP/IPF. There is associated osseous metaplasia, a common but nonspecific finding in UIP. 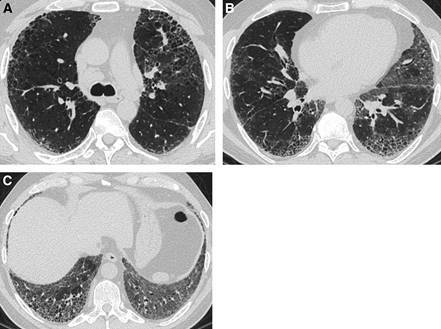 Although these findings are not diagnostic, they do not preclude a diagnosis of UIP/IPF in a patient with supportive clinical and radiological findings.